COLUMBUS, Ohio -- The professional Master in Plant Health Management (MPHM) degree, developed by Ohio State University's College of Food, Agricultural, and Environmental Sciences (CFAES), has become the first graduate program at the university to achieve affiliation in the National Professional Science Master's Association. The first of its kind at Ohio State, the degree is a joint effort of the departments of plant pathology and entomology whose aim is to provide hands-on training that includes both technical and professional aspects of plant health management, as the need for qualified individuals in the field increases. 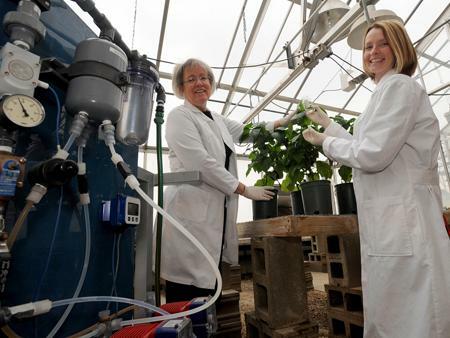 The demand is huge and growing for students and people trained in plant health management because of the increasing demand for global food production, said Anne Dorrance, a professor of plant pathology and co-chair of MPHM. "By 2050, there will be 9 billion people on the planet that we're going to have to feed, which means we're going to have to double and triple the amount of food production on the same number of acres," she said. "We're going to need all the tools in the toolbox and the people skilled in the plant management industry to meet this demand without ruining the planet in the process." The MPHM is designed for individuals who are going into the industry rather than pursuing those who want to pursue a research path, said Jeff Hattey, assistant dean for academic programs in the college. "This program focuses on preparing folks for the professional world, combining science, business and technology skills," Hattey said. "When we look at what's going on in the marketplace, companies need highly skilled workers who can stay abreast of technological requirements and changes coming down the pike, but who are versed enough in the sciences to understand those changes." Combining classroom and e-learning delivery, the program is geared toward recent graduates and working professionals such as Extension educators, agriculture educators, crop advisers, turf/landscape managers and natural resource managers, as well as professionals in business and law who wish to specialize in regulatory, environmental or intellectual property issues. Full-time students can complete the degree in 1-1.5 years, but the program is designed to be pursued part-time and may be completed in 2-3 years. Multidisciplinary in nature, the program's curriculum includes courses from six different Ohio State departments, combining life sciences with business, education and communication courses. "The courses that students enrolled in the MPHM degree will be taking are not different from those taken by other graduate students," Dorrance said. "They are taught by our world-class faculty, not by graduate students. "I'm excited to see the exchange between research-based students and professional-degree students in these courses." The first group of MPHM degree students began taking courses in August 2012, Dorrance said. "This program is representative of a trend that's been expanding rapidly in the past five years, calling for a higher integration of technical and professional skills," said Dan Herms, chair of the Department of Entomology. "I anticipate this won't be the last of this type of degree program offered at Ohio State." For more information, visit http://mphm.osu.edu.